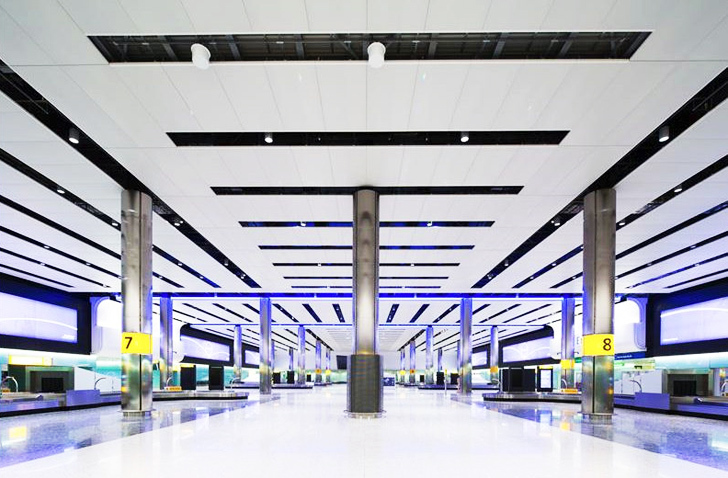 London’s Heathrow Airport just officially opened its brand new Terminal 2 designed by Luis Vidal + Architects (LVA) - but only at 10% capacity. The latest phase in the airport’s redevelopment will operate at a rate of 6,000 passengers per day for the next three weeks as the terminal is completed. LVA worked with Pascall and Watson and Foster + Partners to renovate the terminal into a sprawling mixed-use destination that includes 33 shops, 17 restaurants and free WiFi for travelers to enjoy while waiting for their flights. Following the opening of Terminal 5 designed by Rogers Stirk Harbour & Partners in 2008, Heathrow has continued with a redevelopment plan funded by over $18 billion from private investors over the past ten years. Terminal 2 was designed to be a destination in itself, providing quality retail and leisure amenities for travelers – including a Heston Blumenthal restaurant! The new terminal incorporates 28 gates, 66 kiosks, 29 security lanes and 60 check-in desks. The 40,000 square meter facility is capped with an undulating 50,000 square meter roof, flecked with skylights that flood the interior with natural light. Ten-meter-high glass walls meet the roof, adding an even more airy feel. Terminal 2 was also designed with sustainability in mind. Along with the natural lighting, 20% of the terminal’s energy will be derived from renewable resources, including wood chips, which will save 13,000 tons of CO2 each year. Almost all of the construction waste was recycled or used to generate energy. The new facility should be completely open in 3 weeks. 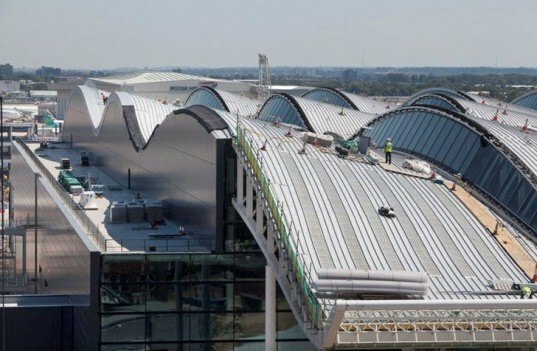 Following the opening of Terminal 5 designed by Rogers Stirk Harbour & Partners in 2008, Heathrow has continued with a redevelopment plan funded by over $18 billion from private investors over the past ten years. Terminal 2 was designed to be a destination in itself, providing quality retail and leisure amenities for travelers - including a Heston Blumenthal restaurant! The new terminal incorporates 28 gates, 66 kiosks, 29 security lanes and 60 check-in desks. The 40,000 square meter facility is capped with an undulating 50,000 square meter roof, flecked with skylights that flood the interior with natural light. Ten-meter-high glass walls meet the roof, adding an even more airy feel. Terminal 2 was also designed with sustainability in mind. Along with the natural lighting, 20% of the terminal’s energy will be derived from renewable resources, including wood chips, which will save 13,000 tons of CO2 each year.